Grandparents are a positive force for families going through difficult times, like separation or divorce. Spending time with grandma or grandpa can help kids with social skills or behavior, especially kids from single parent households, so says a new study published in the February issue of the Journal of Family Psychology. These finding have especially strong implications for the U.S. where grandparents are increasingly living in households with their grandchildren. A 2004 US Census Bureau survey found that more than 5 million households include a grandparent and a grandchild under 18, up 30% since 1990. This is interesting and important information in a country where the divorce rate is estimated to be around 41%. 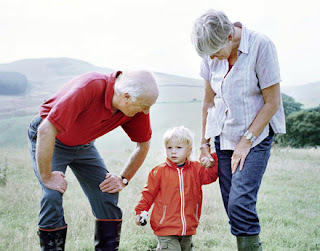 Knowing that grandparents can play such a critical role in the lives of children is enormous, and should place much more value in our older generations; especially since, as people age, they are often devalued by our youth-obsessed society. If you are a single or divorced parent, make sure that your children are spending lots of quality time with the grandfolks–it’ll be healthy for them all.